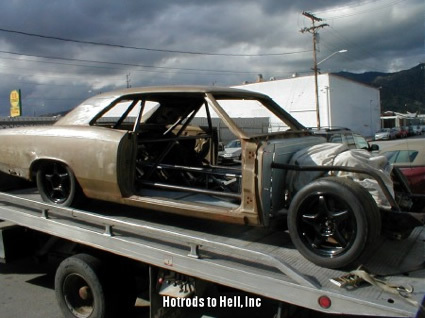 First born on June of 1966 the Chevelle from Hell is a testament to gumption, passion, and the very essance of Hot Rodding. 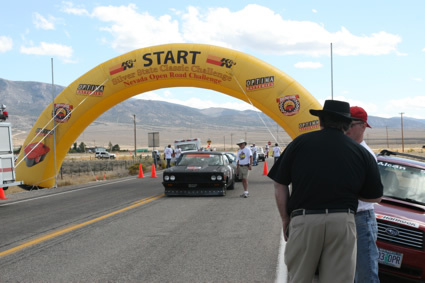 A project that began before we had digital cameras or Internet access. 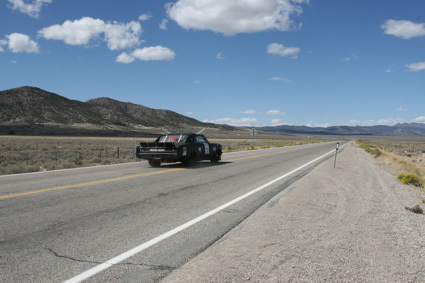 Long before anyone had ever heard the terms Pro-Touring, or Street Fighter. 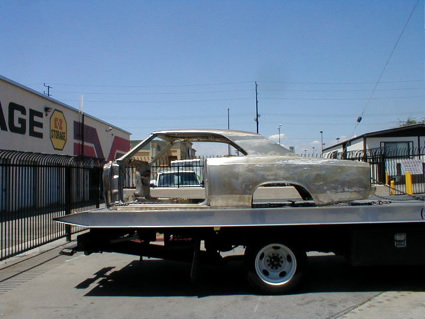 A project that was born in the imagination of a young Southern California boy on his Stingray Bicycle. 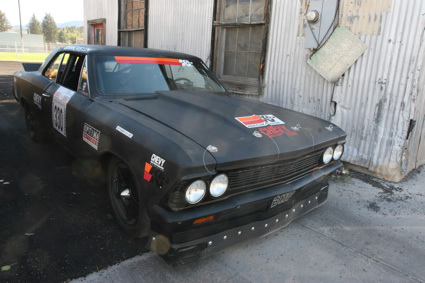 The Chevelle from Hell aspires to take the work done by innovator Smokey Yunik with his famous #13 car and do it one better. 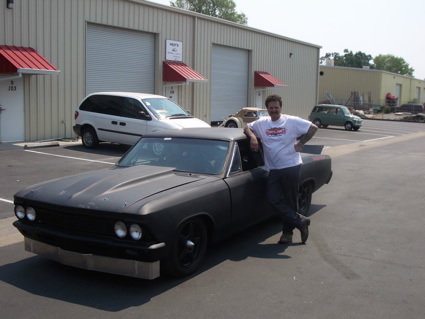 Over the course of it's decade long build, this project has seen multiple owners and been put on hold multiple times, but the vision of the car was never compromised. There never came a time when, "just get it done," took the place of getting every element just right. 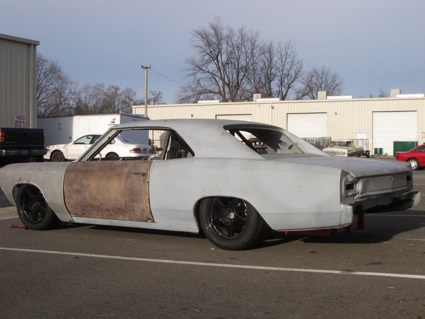 It's the kind of car that draws smiles from young hot rodders that don't know what it is, but know that they love it. 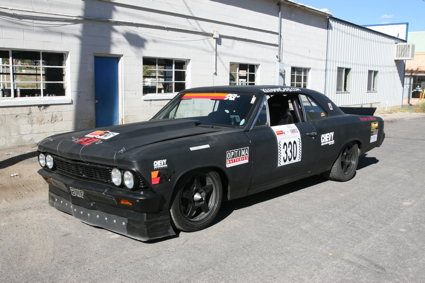 We may no longer have Schwinn Stingrays, but we finally have the Chevelle from Hell. 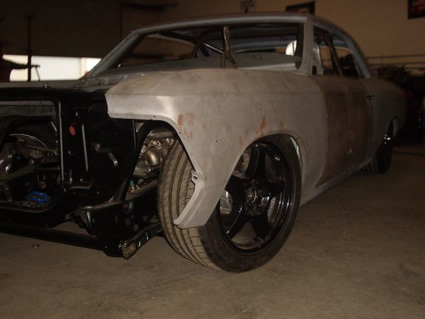 It started life as an ultra clean 327 4-speed that was quickly cut into pieces. The body was cleaned up and acid dipped. 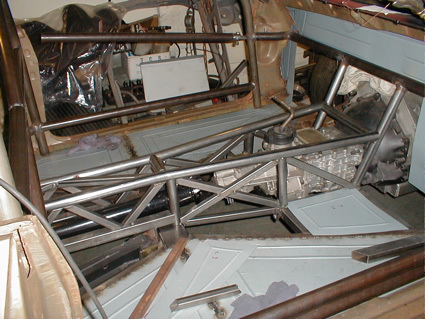 The CFH maintains elements of the original frame. 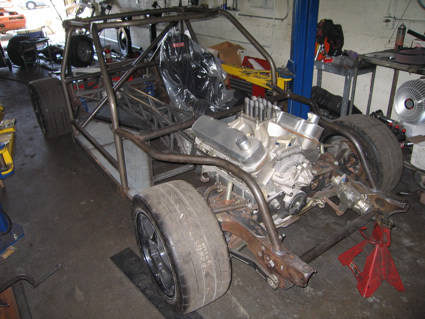 Every inch of the frame has been cleaned welded, chopped up and modified. 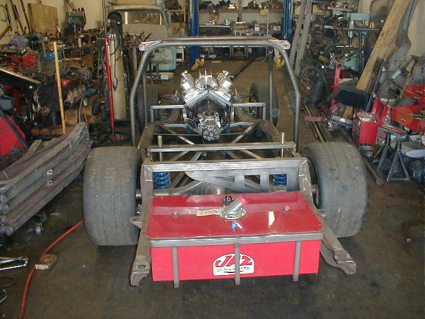 The rear section of the frame has been pinched and raised to accomidate the huge rear tires and to allow for full suspension travel at very low ride heights. 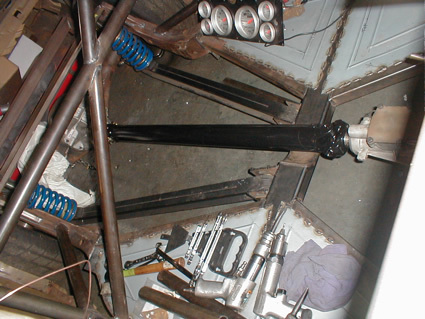 Fabricated spindles, control arms, screw jacks, 6 piston brakes. 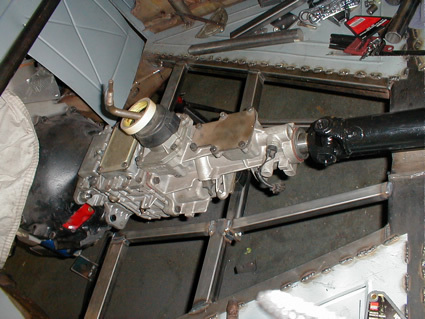 The driveshaft sits above the floor of the car. 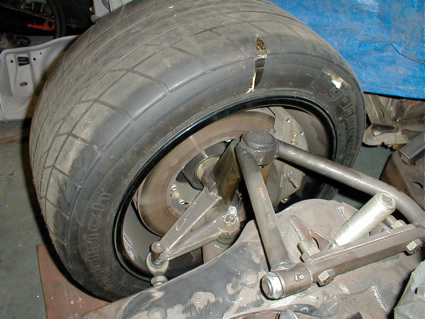 No part of the undercarrige hangs below the pinch welds. 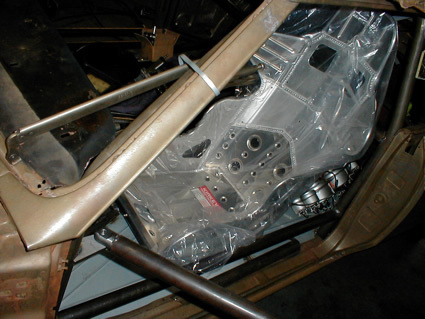 The CFH was given a spine to significantly increase the chassis regidity. 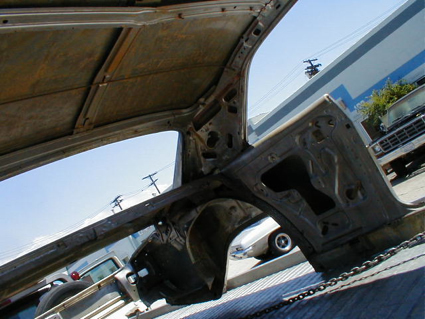 See how it ties together the front and rear sections of the body. 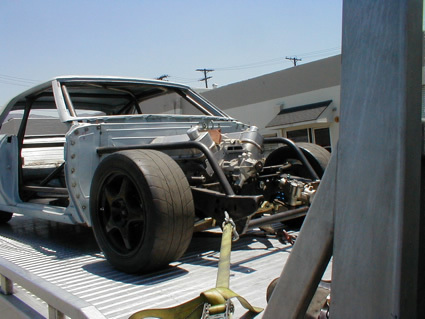 The body of the car was lowered over the chassis, bringing the center of gravity height down. 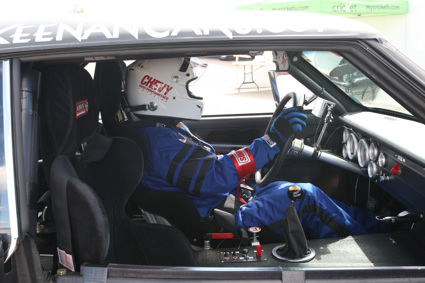 A Kirky Racing seat keeps the driver in place behind the wheel. 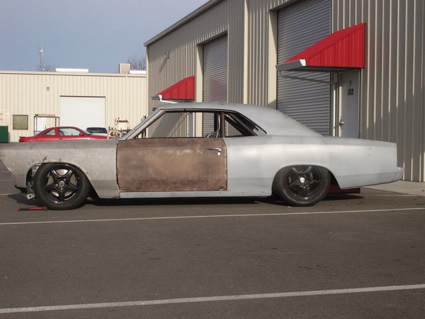 The entire 540 cubic inch Donovan has been set back in the chassis and a custom firewall was fabricated. 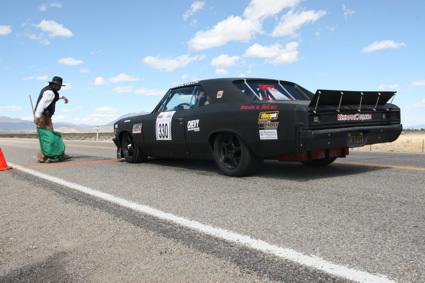 Fiberglass doors and fenders help move the cars weight backwards, giving a better front to rear distribution. Notice how nothing hands below the pinch welds. You can just make out the Fuel Safe fuel cell in the rear of the car. 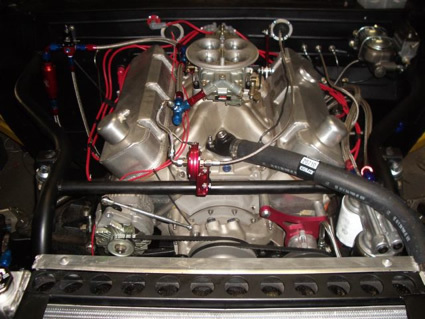 540 cubic inches requires a healthly topend setup. 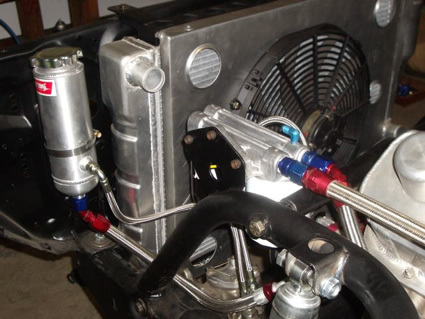 Remote oil filter setup, and power steering reservoir. 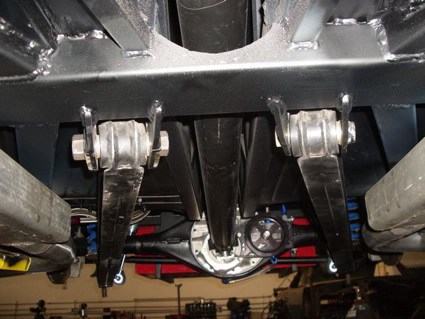 The view from the front looking rearward reveals the full floater 9" rearend, Stage III Truckarm kit, and driveshaft driven rearend cooler. 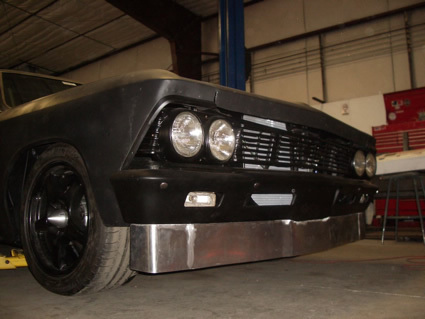 Spintech mufflers do their best to hide the 540 cubic inch beast beneath the hood. 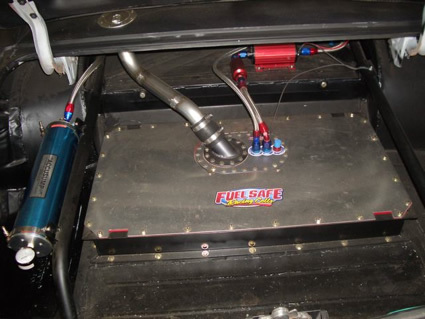 An Accusump keeps the engine safe from oil pressure drop do to g-forces. 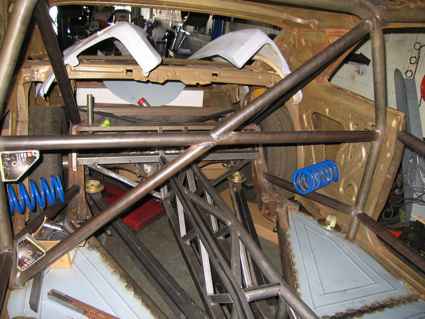 An extension off the roll cage protects the fuel cell. 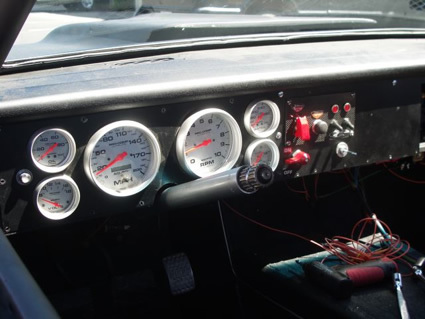 100% custom fabricated dash and gauge cluster, sporting Autometer gauges. A big Bad Airdam. 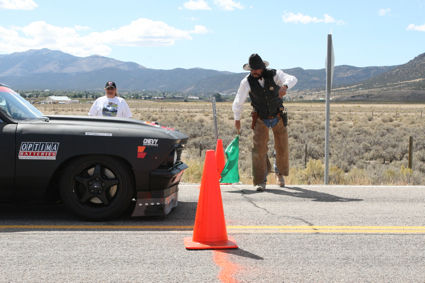 Even 540 cubic inches needs some help cutting though the air. Notice the spike bearing cover on the hub. 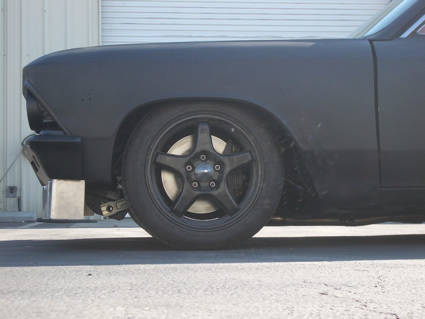 This view lets you see the massive brakes and custom adjustable swaybar. 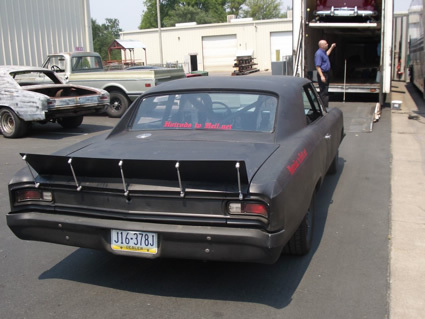 Turnbuckled rear spoiler helps to keep the rear of this beast planted at high speeds.